What Rockwell hardness are your snips? Don’t know? That’s probably why you are replacing snips more often than you should be. 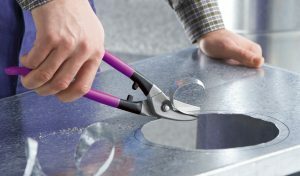 Replacing snips often means two things 1) Spending more money than you have to 2) Using a pair of dull snips because you don’t want to replace them. Do yourself a favor and read our guide for additional purchasing info, shop our wide range of sheet metal snips, and then buy a pair that will last longer and do better work than you are used to.